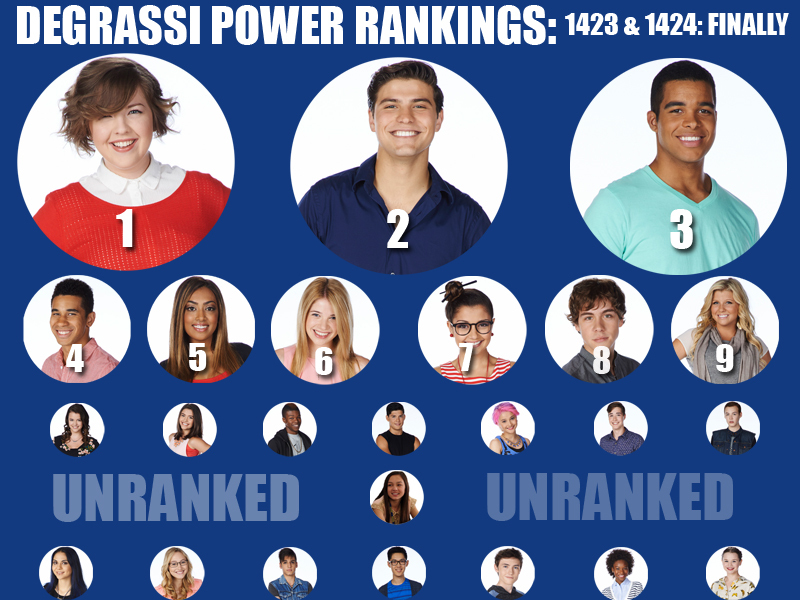 It didn’t really feel right ranking anyone except the departing characters in this episode, especially with so many of the younger cast members dominating the top half of the rankings. So this one only ranks the graduating class (and Eli) in the finale. I’m not going to do any rankings for the 2-hour special since it’s sort of in its own little universe, so this is the final one for season 14. My review of Clare’s plot in Finally says all that needs to be said about why she’s in the number 1 spot. Drew Torres’ character arc for the past several years has been the show addressing his extremely low self esteem. He’s afraid he’ll accomplish nothing while everyone else goes off to do great things. They reminded us of that when announcing everyone’s post-Degrassi plans, while Drew’s future is unknown. Another fear is everyone will forget him, but Dallas assured him they’re bros for life. As always, Connor is on point with what little time he’s given. His spacesuit promposal. Not caring what they do as long as he can wear his tuxedo (since the deposit is nonrefundable). His selfie vs. groupie explanation. “Some of us are hungry.” Reading the secret text aloud. His graduation speech. Speaking of, during his speech he snarkily said “I learned many things at Degrassi, but not from the classes they were too easy.” If you watch the beginning of the scene where the seniors finish their final exam, you’ll see Connor asleep since he finished his well before everyone else. I have more confidence in endgame friendships on Degrassi than endgame relationships. Not to say endgame couples won’t remain together for forever, but it’s easier to envision best friends still together decades down the road, and that’s how I imagine Dallas and Drew. This episode is one of the few where the girls got to hang out without some major drama happening in any of their lives. I really like the scene where the three of them were hanging out in Clare’s room. The show was pretty much done with Alli’s character after she and Dallas got together, so like her brother she basically got to quietly coast to the finish line. Degrassi conga line. Supportive friend, and she did not give into Drecky! I hate to see that she (once again) wasted her time on Jack. But watching her express her joy for the best relationship she’s ever had at Degrassi (a friendship with Becky was a beautiful thing). Eli was here, but this episode was all about Clare and what she wants to do with her life. Jenna’s major moments on the show were her being deemed the “boyfriend stealer,” and her pregnancy storyline. Other than that, she took a massive backseat to the lives of Clare and Alli. Lost in all of that was her passion for music, which disappeared just like many characters’ initial hobbies. The weird thing about it is she wasn’t involved in any of the numerous occasions over the course of seasons 13-14 where characters seemed to break out into song every other episode. I’m glad they reminded us music is her dream, and have her leaving the show to pursue that. I am also in love with Claire. What a HOTTIE! Jenna really didn’t have enough to do here. And I have to admit even Connor didn’t have enough on the show. They could have explored what it’s like to be an adolescent on the autism spectrum, but didn’t go as far as they could have. He wasn’t even the central character in the episode where it was revealed he has Asperger’s, and he wasn’t even present for that scene. That’s a big problem I have too. There’s Winston, but he just isn’t as endearing or adorable as Toby, Connor, and Wesley were. Clare and Maya aren’t really considered “nerds” in-universe. Arlene is apparently dunzo. Liberty was the closest thing to an A-list nerd on the show and we all know how shabbily the writers treated her and wasted her potential. I have this theory that the-n/TeenNick have influenced the lessening of nerdy presences on the show over the years (it’s a long story, but I do think that the network has an anti-nerd bias for various reasons). Maybe things will change now that they no longer have a stake in the show.